The Delta-Nit Pad begins the finishing process after dyeing, bleaching, or scouring of circular knit fabrics. 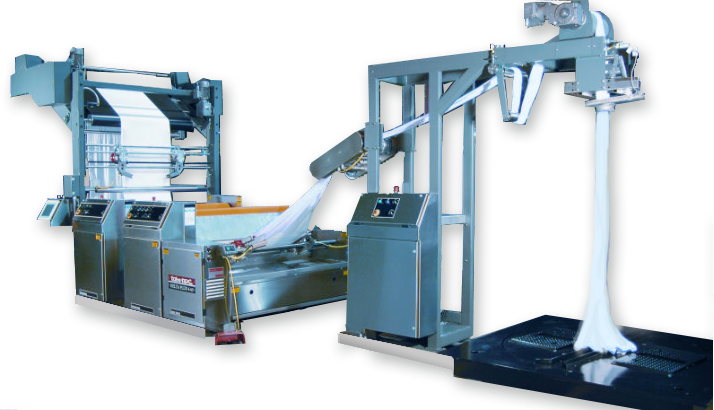 The Delta-Nit Pad processes either single or double strands of fabric and is available in either a two- or four-roll setup. Designed to be operated by only one person, the Delta-Nit Pad handles detwisting, spreading, extracting and chemical application. The detwisting process begins at the hydraulic-powered turntable which is installed in the floor at the front of the Delta-Nit Pad. The heavy duty turntable uses an inverter controlled soft starting pump that minimizes the stress on the turntable. Our optional power-driven cloth lifter, torque compensator and automatic detwisting sensor removes the twist from dyeing and carries the fabric tension-free to the Delta-Nit Pad. The Delta-Nit Pad spreader uses an internally driven belt spreader system for proper width and length control. Our patented Touch-O-Matic low pressure gas-charged expander allows width adjustments while the machine is in operation. The spreader is designed to overfeed during operation, which reduces shrinkage at the pad. The Delta-Nit Pad extractor passes the spread, relaxed fabric to a 5-gallon (18-liter) rewet-out tank. The re-wetting ensures the next step, whether drying or chemical application, is uniform in its application. Our automatic ballooning system injects air into the wet fabric tube and improves crossline. The balloon is controlled to improve width uniformity. The innovative design uses two matched 9″ (22.5 cm) diameter rolls to extract the maximum moisture from the tubular-formed fabric. Delta-Nit Pad’s 5 gallon (18 liter) chemical tank holds softener, resin, or other hand builders which are uniformly applied. An automatic ballooning system injects air into the wet fabric tube to improve crossline and chemical impregnation. The unique tank design reduces dilution of the chemical concentration. Two matched 9″ (22.5 cm) diameter rolls to extract the maximum moisture from the tubular-formed fabric. Navis TubeTex is proud to introduce the Constant Quality Concentration (CQC) System as an option to our Delta-Nit Pad, designed to mix chemicals on demand to conserve finishing products and improve quality in all fabrics. The CQC System automatically and continuously reads, monitors and corrects the Delta-Nit Pad’s bath concentration. Air: 80 psi (414 kPa), Consumption Neg. Navis TubeTex designed the CQC System to be supervisor driven, so only designated personnel can access recipes, including valve operations, set points and allowable tolerances. Supervisory-only access means product consistency is 100% assured. Once the function and timing for CQC recipes is established, an operator can use the Delta-Nit Pad’s control panel to start and run the set chemical application process.